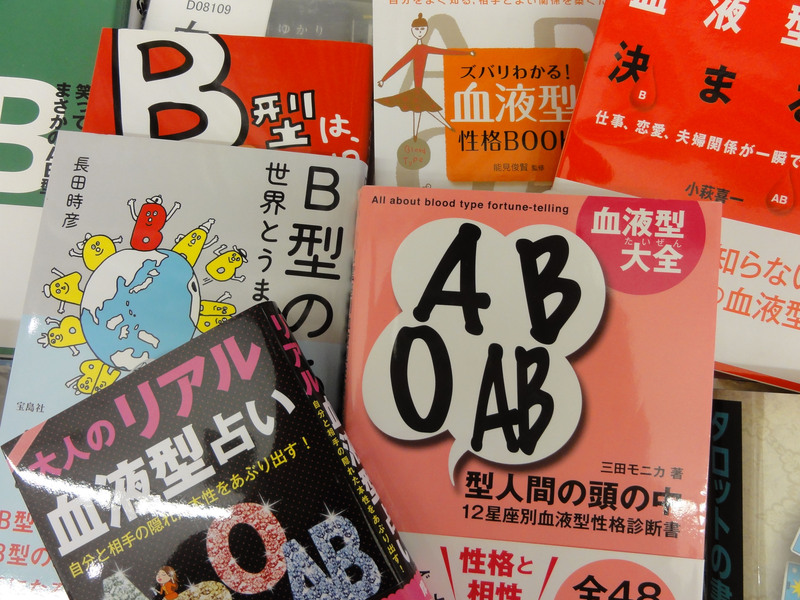 Blood will tell: Any Japanese bookstore worth its salt offers a full selection of books on ketsueki-gata uranai, or love-matching based on blood type. Can you please explain why the heck Japanese are so interested in my blood type? I can’t tell you how many times I’ve been in a normal social situation and someone asks if I’m type O or whatever. I don’t mind so much when it’s a pretty woman posing the question, but it does strike me as a weird thing to ask, especially of someone you’ve just met. And they always seem taken aback when I say I have no idea. But why should I know my blood type? I’ve always been healthy. Ah, the ketsueki-gata (blood type) conversation. We’ve all been there. You’re having a chat with Japanese friends or coworkers when someone suddenly wants to know your blood group. Before you can answer, someone will say something like, “A-gata deshō” (“Oh, you’re Type A, right?”). And if they happen to be correct, everyone nods knowingly. But I’d advise you not to get your blood pressure up on this one. In most cases, the question is simply an effort to get to know you better. For the benefit of readers who haven’t been in science class recently, let’s do a little review. All blood is made up of the same elements, but not all blood is alike, and around the beginning of the 20th century scientists made discoveries that led to the development of what’s called the ABO blood group system. This sorts blood into four groups — A, O, B and AB — depending on the absence or presence of certain antigens, which are inherited substances that can trigger an immune response if introduced into an incompatible body. In most of the world, there’s little reason to be aware of your own blood type unless you’re about to receive a blood transfusion. But in Japan, nearly everybody knows their own blood type. The reason for this is a popular belief that personality is determined by blood type. According to a widely shared typology, someone with Type A blood, for example, will be kinben (diligent), kireizuki (neat) and sensitive to the feelings of others, while type Os are jihatsuteki (self-starters), riseiteki (logical) and tend to do things their own way. It all works a lot like horoscopes in the West. Furthermore, many Japanese believe your blood type is a predictor of your compatibility with others, so there is a booming business in ketsueki-gata uranai, or love-matching based on blood type. But where did such ideas originate? In Europe, actually, where research in the 1910s and ’20s looked at blood type distribution in an attempt to prove the superiority of some races over others. The theme was picked up in Japan by an academic named Takeji Furukawa and a paper he published in 1927 attracted a fair amount of attention. 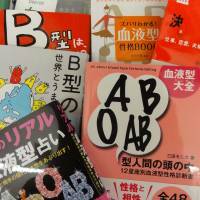 But it wasn’t until the ’70s, when a layman named Masahiko Nomi revived Furukawa’s work in a series of popular books, that the idea of linking blood type to personality gained hold in the general public. There are two reasons such theories caught on in Japan but not in other countries, according to Yoshiyuki Watanabe, professor of human psychology at Obihiro University of Agriculture and Veterinary Medicine in Hokkaido. One, he said, is that Japanese culture has traditionally put a great deal of emphasis on the importance of blood in the transmission of hereditary traits. The other is that unlike some countries, there is a relatively balanced distribution of blood types within the Japanese population: approximately 40 percent Type A; 30 percent Type O; 20 percent Type B and 10 percent Type AB. There is, however, no scientific basis for believing that blood type plays any role in determining personality. This has been demonstrated again and again, and most recently in a large-scale study of more than 10,000 people in Japan and the United States that was recently reported in the Japanese Journal of Psychology. But it’s not a question of science for most people, according to Watanabe. On the whole, Watanabe sees the Japanese focus on blood type as relatively harmless. While there have been reports of a few companies allegedly discriminating against certain blood types — Bs generally get a bad rap for supposedly being self-centered — as well as the occasional case of so-called burahara (harassment based on blood type), these incidents have been blown out of proportion by the media, particularly by foreign news outlets who always seem to be on the lookout for another wacky news story out of Japan. This column appears next on Nov. 15. Puzzled by something you’ve seen? Send a description, with a photo, if possible, to whattheheckjt@yahoo.co.jp or Alice Gordenker, L&C Dept. The Japan Times 4-5-4, Shibaura 4-chome, Minato-ku, Tokyo 108-8071.